Brain washed or informed or both? 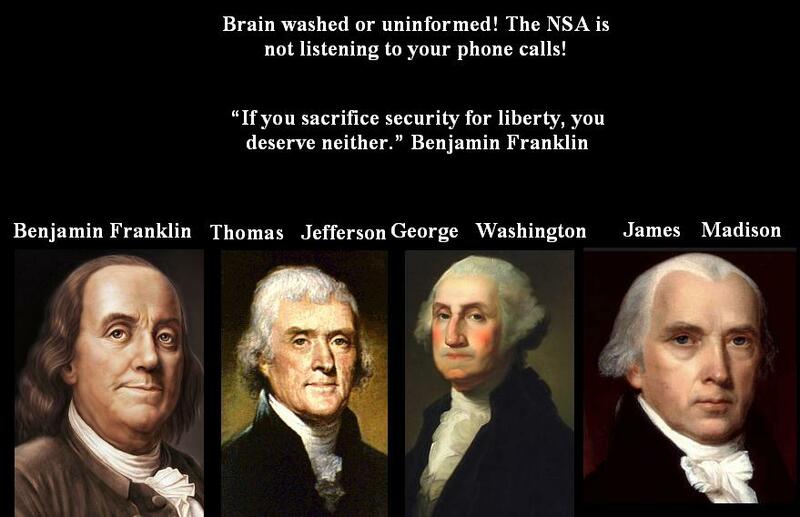 The NSA is not listening to your phone calls! The world is far different today that it was in the 1700S’ and we either adjusts with time or we would become insignificant and dead. Benjamin Franklin didn’t have to deal with 9/11 and the aftermath that followed. Benjamin Franklin didn’t have a bunch of lunatics, Al Qaeda, that have killed thousands of Americans and vow to continue to kill until they end up in heaven with 72 imaginary virgins. The amazing thing about people who are always running down the Government is that, they are the same ones that are quick to fault the Government when tragedy strikes. You can’t have your cake and eat it too! If you had a brother, sister, mother, father, son or daughter, that are somewhere in no man’s land fighting and dying to protect America, perhaps then and only then, you would see the need for us to do all that has to be done to protect America and its people. America has people with big and caring hearts, but America also have lots of people who are brain washed or just plain uninformed. Both Democrats and Republicans in Congress voted to enact the NSA program and it has worked to keep us safer! If your white teenager son was killed by an African American Man and found not guilty by an all African American Female Jury, what would you think? If you as a white person was the Parent of a 17 year white male teenager that had gone to the store around 7PM to buy candy and a soft drink and on your child’s way back home, an African American Man stalked your child; called the Police and told the Police that he saw a suspicious looking person that was up to no good. And the Police told the African American Man they are dispatching a patrol and that he does not need “to follow your child,” but, your child ended up being dead under the same circumstances as did Trayvon Martin, and the Police even though they handcuffed the African American Man, five hour later they released him., what would you do? Then through friends, families and other people demanded via the Media for the arrest of the African American Man and they finally arrested him and charged him for 2nd degree murder. And during the “voir dire” the Prosecution and the Defense agreed on six (6) African American Female Jurors. Then subsequently, the trial proceeded exactly like it did in the George Zimmerman Trial. Next, the Jury went into deliberation for 16 hours and 10PM at night they announced they came to a verdict. If you are really a parent and you are sincerely honest, it would be nice to hear your truthful answer as to what you would do and think? What you would do? How would you react? Would you say that “race” was involved in the targeting and killing of your child and the not guilty verdict by the all African American Female Jurors? 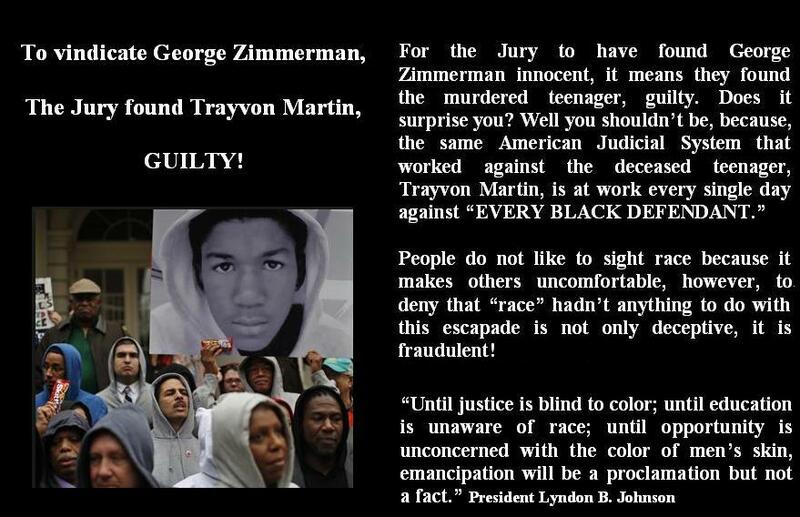 Trayvon Martin is dead solely because he was black; George Zimmerman walked free because he is not! Trayvon Martin was killed by George Zimmerman solely because Trayvon was African American. Zimmerman targeted the kid from the minute he set his eyes upon him; he got out his vehicle even though the Police told him not to follow the kid; Zimmerman got into a confrontation with Trayvon and when he found himself in trouble, he shot the kid. The WHITE Juror that spoke with Anderson Cooper, she along with the other Jurors vindicated George Zimmerman but found Trayvon Martin guilty. The 99 million dollar question is; “Why did the Prosecutors agree on five white women and one Hispanic?” They knew that George Zimmerman was part Hispanic, so the question begs an answer as to why? The Juror that gave the interview to Anderson Cooper revealed in her own words even though she chose to hide in the dark, that she was going to vindicate George Zimmerman even before the deliberation ended and blame it on the deceased teenager. Even after praising Zimmerman endlessly she was asked by Anderson; “Do you feel sorry for Trayvon Martin? 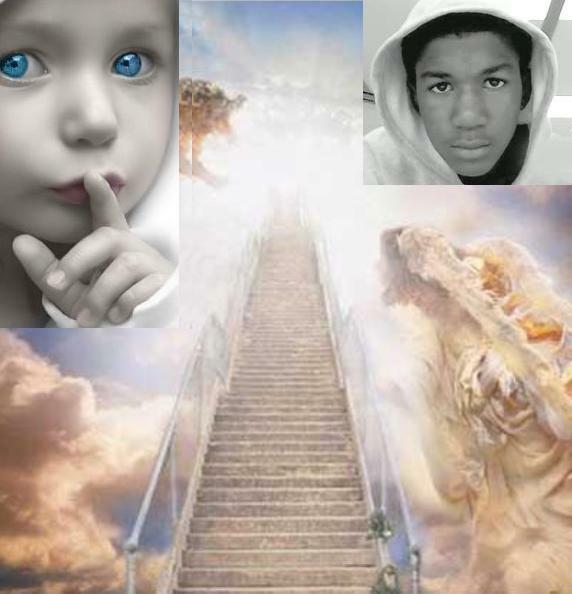 She said; “I feel sorry for the both of them!” Just imagine, the teenager lost his life to a crazed and deranged lunatic and she, the Juror, couldn’t even bring herself to say that she felt sorry for the teenager without adding Zimmerman. “Every step Mr. Martin took toward the end of his too-short life was defined by his race. I do not have to believe that Mr. Zimmerman is a hate-filled racist to recognize that he would probably not even have noticed Mr. Martin if he had been a casually dressed white teenager. 98% of the Country is Middle-Class or Poor, and yet they repeatedly vote Republicans into office, that is against their own interest! The Republicans in the House and in the Senate have literally brought the country to a “standstill,” and the Majority Leader should do something about it. There are many areas to criticize President Obama, but, there are areas where his policies have worked for the good of the country. Look at the where the stock Market is today and contrast that with 2008! People’s 401K Plans and Pension Funds were almost wiped out, however, with the S & P doing very well, people can “live” again. The unemployment that was so unbelievably bad, has bounced back and even though it is not perfect, unemployment today is far better than when Obama took office. Wall Street dishonesty catapulted by Republicans indulgence to “only” protect the rich, crashed the housing market for the “working-class,” and it literally fell off the cliff, but in the recent years, we are rebounding! America’s Automotive Industry was saved due this President and his predecessor, George W. Bush, willingness to not give a hand-out, but rather, a helping hand. AIG – The world’s largest Insurance Company if allowed to fail it would have cost the Tax-Payers 1.5 Trillion. That too was saved and AIG have repaid all of the loans that were made by the Federal Government. When you think about it, the House Republicans have voted 37 times to repeal Obamacare, and they are at it again, going for a 38 Vote, while other very important legislation are tossed by the way-side! The recklessness by the Republicans does truly hurt the Middle-Class and the Poor and even though 98% of the country is in that category, they still vote these people into office! Why do people vote against their own best interest, I will never know! 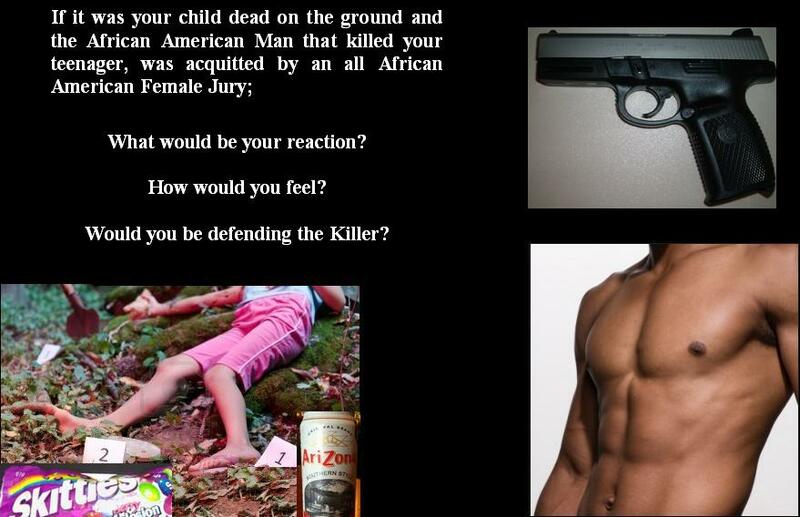 To vindicate George Zimmerman, the Jury found Trayvon Martin Guilty! People do not like to sight race because it makes others uncomfortable, however, to deny that “race” hadn’t anything to do with this escapade is not only deceptive, it is fraudulent! Women should be really ticked-off at Mark O’Mara, for attempting to insult their intelligence! We also know factually from the 911 call and George Zimmerman’s own words that he, George Zimmerman felt that Trayvon Martin was up to no good; we also know from Zimmerman’s own words that he Zimmerman, stated that “they always get away; we also know from the 911 call that Zimmerman told the 911 Operator that Trayvon Martin was running away; we know that Zimmerman got out of his vehicle. All of the above are not in dispute and the only thing that is in dispute is that there was a confrontation and Zimmerman killed Trayvon Martin. O’Mara told the all female Jury that “there is no evidence in this case; that the State did not provide any evidence; that the deceased teenager used concrete as a weapon; that his client was the victim and I could go on, but I think by now you would have gotten the idea of where I am going. 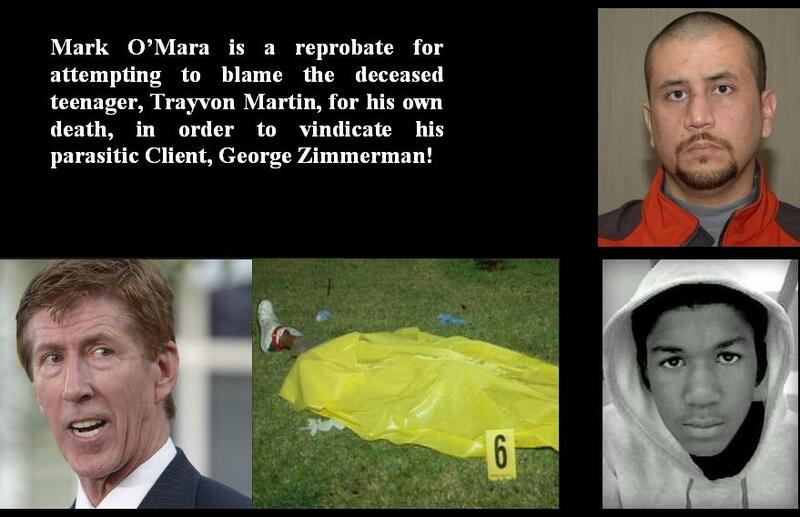 O’Mara’s phantasmagoric rationales and internecine assumptions of what transpired during the confrontation doesn’t make Trayvon Martin any less dead, and it is my belief that the Jury will take into consideration the totality of all of the circumstances and find George Zimmerman guilty of Second Degree Murder. Attorney Mark O’Mara is a reprobate for attempting to blame the 17 year old deceased teenager for his own death, in order to vindicate his parasitic client!